These interesting facts about the current Dalai Lama will help provide a better picture of the man behind the title. His Holiness, Tenzin Gyatso, the 14th Dalai Lama, has already warned that he may be the last of his line. Unlike his predecessors, he was able to take advantage of the Information Age to spread a message of peace. He has authored scores of books and travels the world each year to speak before large crowds. The Dalai Lama can be seen while at his home in exile in McLeod Ganj, India. Thousands attend his speakings to hear his message of nonviolence. The 14th Dalai Lama is the spiritual head of Tibetan Buddhism and a hero to millions. He was born on the dirt floor of his impoverished family’s horse stables. Although he was one of 16 children, only seven of his brothers and sisters lived to see adulthood. The current Dalai Lama is the longest living and longest reigning of all his predecessors. He has mentioned several times that he may also be the last of his line unless something changes. The 14th Dalai Lama’s family actually spoke a modified version of a Chinese dialect from the western provinces of China and did not speak the Tibetan language. The the soon-to-be 14th Dalai Lama was already four years old in 1939 when he was escorted in a caravan to Lhasa. He was considered “old” to be discovered as a Dalai Lama, and some lamas expressed concerns about starting his training so late. At the young age of 15, the 14th Dalai Lama was given full power over Tibet after the Chinese invasion of Tibet. As a teenager, he was forced to meet with Chinese leaders and negotiate the future of his people. At the time, he was considered both spiritual and political leader of Tibet. The Dalai Lama later relinquished political powers and focused on being a spiritual figurehead. Despite many pleas for help to all the world superpowers, not much was done to help Tibet when they were about to be overwhelmed and invaded. The CIA did play an active role in helping the Dalai Lama to flee Tibet and go into exile in India in 1959. In 1989, the 14th Dalai Lama was awarded the Nobel Peace Prize. Unlike several other world leaders on the list of laureates, he has yet to order a drone strike or refugee purge. In 2007, he received the Congressional Gold Medal — the highest civilian honor given by the U.S. Congress. Unsurprisingly, the 14th Dalai Lama strongly opposes nuclear weapons. He serves as an advisor in the Nuclear Age Peace Foundation. The Dalai Lama wants to return to Tibet but has said he will only do so if no preconditions exist. The Chinese government’s rebuttal was that the Dalai Lama must return as a Chinese citizen to show patriotism. Sadly, the Dalai Lama travels with a security entourage — even at his home in India. His life has been threatened many times. The 14th Dalai Lama declared that the next Dalai Lama won’t be born under Chinese control. He has also hinted on numerous occasions that he may be the last Dalai Lama to be discovered. During speakings, the 14th Dalai Lama hinted there is a possibility of his successor being recognized in a Western country, and women may be candidates. In 2011, the 14th Dalai Lama insinuated that he may "retire" at age 90. Dalai Lamas May Need a Permit to Reincarnate! The Chinese government has expressed plans to elect the next Dalai Lama through means of a committee. The plan, as part of "Order No 5" by the State Administration of Religious Affairs, is to require a permit for reincarnation! How reincarnation requirements will be enforced has yet to be decided. When fleeing Lhasa to go into exile in India, the Dalai Lama was disguised as a soldier and given a real gun as a prop. In a video interview later, he laughed remembering just how heavy the rifle was he had to carry as a teenager. In the 1997 Martin Scorsese film Kundun, an epic about the life of the 14th Dalai Lama, the decision was made to deviate from history and not have the Dalai Lama touch a rifle. Despite compassion for all living things, the Dalai Lama grew up eating meat as most Tibetan monks do. Eating meat is considered okay as long as the monk himself doesn't kill the animal. Consuming meat is often a necessity for maintaining health at high elevations where vegetables aren't easily grown. The 14th Dalai Lama didn’t switch to a vegetarian diet until living in exile in India where vegetarianism is easier. Because of health problems, he switched back to eating meat on occasion but suggests that people follow a more vegetarian diet when possible. His home kitchen is vegetarian only. In 1995, the Dalai Lama selected Gedhun Choekyi Nyima as the 11th Panchen Lama — the highest ranking lama beneath the Dalai Lama. His choice for Panchen Lama went missing at the age of six (presumably abducted by the Chinese government) and Gyaincain Norbu was chosen to be the new Panchen Lama. Many people around the world do not recognize the government’s choice for Panchen Lama and suspect foul play. The 14th Dalai Lama tours the world, meeting with governments and giving teachings at universities; students are often allowed to put forward questions for him to answer. He also appears on television shows and regularly meets with celebrities. 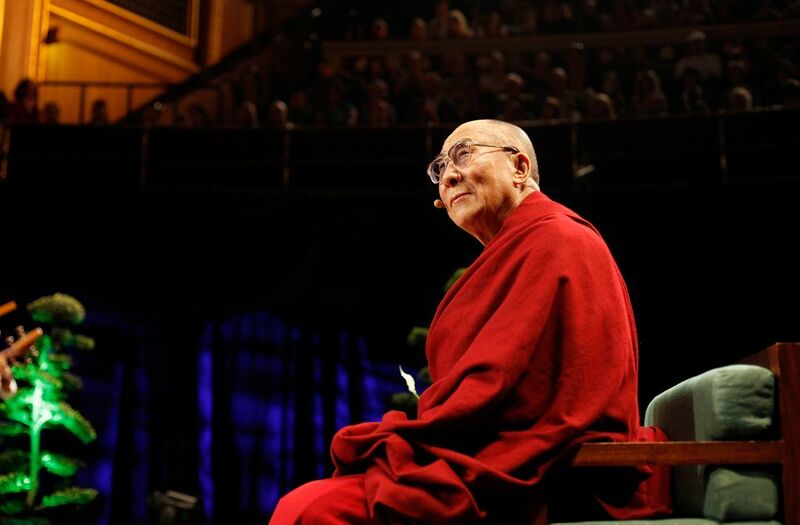 While traveling abroad, the Dalai Lama does teachings in English. While at his residence of Tsuglakhang in North India, teachings are given in the Tibetan language so the Tibetans can directly benefit. His talks are always free to attend in India. Western travelers are warmly welcomed. The 14th Dalai Lama has been very interested in science and mechanical things since childhood. He has said that had he not been raised a monk, he probably would have chosen to be an engineer. A visit to the astrophysics department at Cambridge University was part of his very first trip to the West. During his youth, the 14th Dalai Lama enjoyed repairing watches, clocks, and even cars whenever he could spare the time. In 2009, while speaking in Memphis, Tennessee, the 14th Dalai Lama said that he considered himself a feminist and fights for the rights of women. His stance on abortion is that it is wrong according to Buddhist belief unless childbirth is a threat to the mother or the child. He followed up to say that the ethical considerations should be considered on a case-by-case basis. In a May 2013 Harris Poll, the Dalai Lama outranked President Obama in popularity by 13 percent. The 14th Dalai Lama has 18.5 million followers on Twitter and regularly tweets about compassion and solving conflicts without violence. In 2017, John Oliver conducted an interview with the 14th Dalai Lama on his late-night HBO show, Last Week Tonight. Although the Dalai Lama is loved as a spiritual leader and role model, photos and images of him have been banned in China-occupied Tibet since 1996. Tibetan flags are also illegal; people have received stiff prison sentences and even beatings for possession of a Tibetan flag. As featured in the film Seven Years in Tibet, the Dalai Lama did meet Austrian climber Heinrich Harrer at age 11. Harrer was invited to become translator of foreign news and court photographer so that the young Dalai Lama could keep him close. The Austrian was esteemed as a well of knowledge about the Western world. Harrer became one of the Dalai Lama's early tutors and introduced many Western concepts and scientific ideas. The two remained friends until Harrer's death in 2006. Unlike his predecessors, the 14th Dalai Lama can be followed on Facebook, Twitter, and Instagram.